Outside Japan, it’s rare to find a restaurant like Ijji. Think minimalist. Serenity. Ritual. Understatement. Precision. On a busy block on a busy San Francisco street, Ijji is almost invisible. Even if you’re looking for it, you could still miss it. No sign, no grand entrance, only a discrete iii on the Japanese curtains that face the street. Once inside, it’s tiny. Just 15 seats, seven of them at the counter. If you can, sit at the counter. You’ll not only watch your chef — one of three — prepare each item of your 19-course meal, you’ll talk to him about the meal, about the special ginger, the house-prepared soy sauce, which items to eat with chopsticks and which to use your fingers. Seafood is the big item here, much of it flown in from Japan. Oyster, mackerel, eel, octopus, tuna, sea urchin, snow crab and more. Each just a bite or two; each a different taste and texture from the ones before and after. You’ll notice the minimalism in the design, the décor, in your chef’s economy of motion and words. From the Japanese greeting to the sidewalk farewell and thank you, you’ll experience the ritual. In the whispered words between chefs and the silky silent service from the waiters, you’ll understand the understatement. And from watching your chef make exacting cuts with his impossibly sharp knife in a ribbon of tuna, the precision will quietly announce itself. 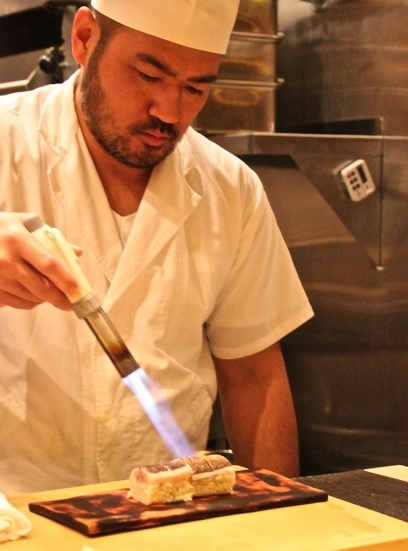 Dinner at Ijji is much more than just a meal; it’s a rich experience. The cost is $135 for 19 courses. Reservations are expected. There are two seatings a night: 6:00 and 8:30. Get there early for each; parking is iffy and traffic, dense.